Today Chris and I tried to make a baby without touching each other (well later on we will try the normal way too!!). Totally weird. Last night I had killer ovulation pain. Both my ovaries were painful when I went to bed – the timing seemed to be just right, 12 hours before the scheduled artificial insemination procedure. Thankfully, I woke up this morning with just a dull ache in my ovaries rather than a sharper pain. Chris worked from home today and I had a day of leave planned. We headed out to the clinic for our 10AM appointment and we were out of there by 12PM (with a short interlude to Starbucks). First of all Chris gave his sperm specimen for washing. He didn’t take long at all! Then we headed to Starbucks for a quick coffee and catch up on a bit of work. 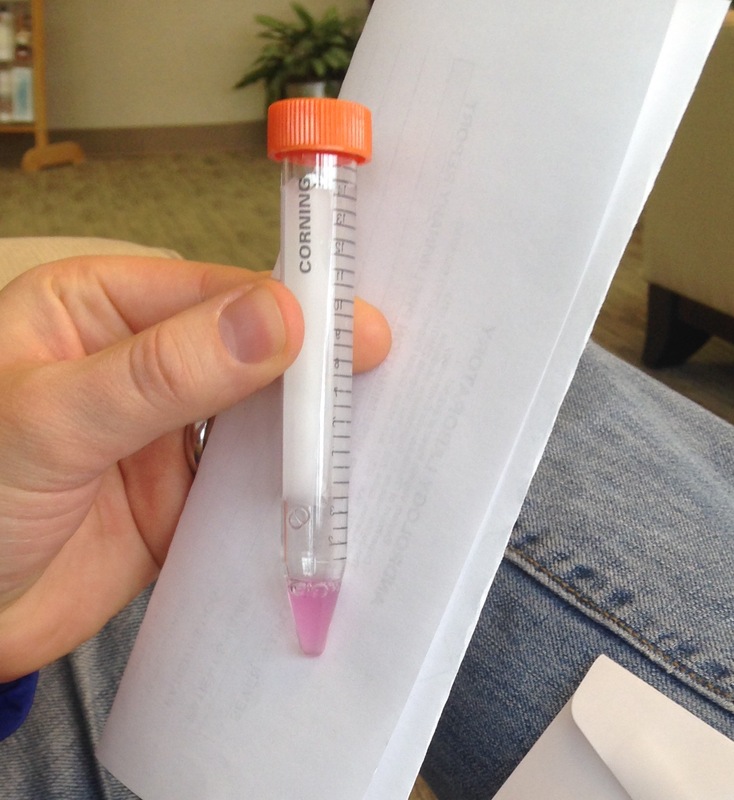 Chris collected his washed sperm sample and we waited in the waiting room with his purple sperm for about 20 minutes. Yup it was purple! It seemed a bit weird sitting in the waiting room whilst Chris held his sperm…but then again I am currently blogging about his sperm, so we are not prudish about it. It was just weird and I can’t put my finger on why. We did get a good giggle though from the diagram on the results form. It was more of a cartoon than a diagram because I don’t think it accurately represents a medical procedure of washing sperm. But perhaps it is, and this is how they wash the sperm, in a nice warm bubble bath. I wasn’t nervous about today, just more excited to get it over with. I was called into the examination room with Chris and the nurse briefed us on the procedure. Very simple. A speculum is inserted, without any lubrication (because that kills sperm), then a catheter is inserted through the cervix to the womb. The sperm are then slowly injected into the womb. Actually it wasn’t very slow and was over within seconds. Apparently the doctor pulled a funny face after she removed the catheter. I didn’t notice as I was concentrating on the picture taped to the ceiling of a happy place – a tropical island beach. The face was one of puzzlement. Chris wondered if she was going to say that something didn’t work. But no, that was it, over and done with in less than 2 minutes. It was painless and hurt less than a pap smear test. I was asked to lay down for 15 minutes, and the nurse left a timer. We laughed about bun making, ovens and timers. All in all, the process was very easy. I’ve had cramping for most of the day, but I’d rather that than the sharp ovulation pain I was having any day of the week.